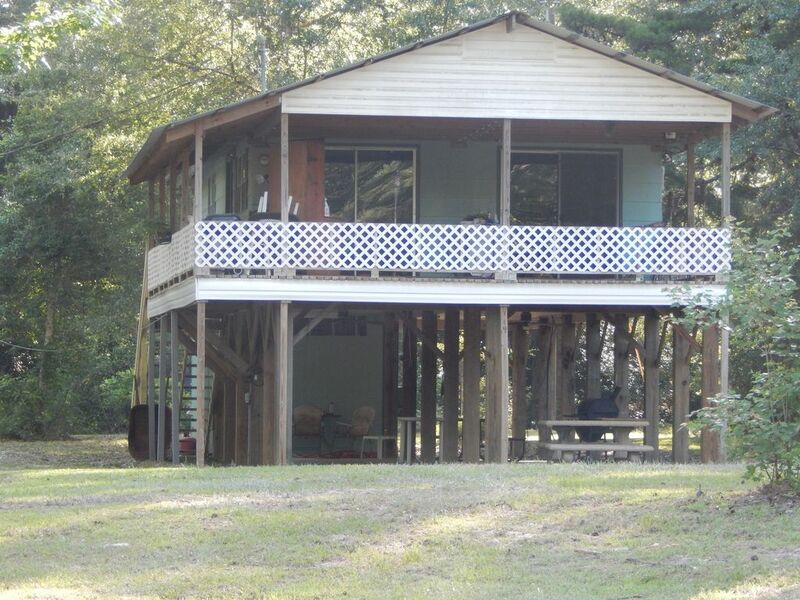 Uncle Ralph's Cabin Rental has 3 beautiful properties located overlooking majestic Red Creek. Cabin #3 is a 2 bedroom 1 bath house that is the perfect get away for someone looking for a quiet peaceful quaint place to enjoy a vacation like no other. You will be very secluded with a private owned beach, play area and barbecue grill right off your front porch. The creek is the perfect depth for children of all ages to play in. The wildlife and peacefulness is abundant. The property was just remodeled in April of 2016. The property has satellite TV, cold air, running well water and a view to die for. Perfect place for a family. The entire space under this house on stilts is concrete with fans and outdoor bathroom. Perfect for a large group to have a great time. Bring your tubes or canoe and floats. Floating Red Creek is possible... start point at Perk Beach on Hwy 49 under the bridge and you will have a 4-6 hour float until you end your trip right at the beach of your rental just look for our stage with our website www.uncleralphscabinrental.com. If you are looking for a quiet peaceful get away or a fun filled adventure you have found the right place at Wendel's Place! This property has been obtained because of the close proximity to family land passed down from generation to generation. This quiet place is at the end of our private road were we have 2 other properties. It just enabled us to have an entire beach front property with no one in between for privacy and tranquility. We hold these hidden gems close to our hearts and would love to share the experiences we had as children with you and your children. Bring your kayaks, canoes, or tubes and relax! Very peaceful private property . Serenity is calling! This cozy house sits right in the rivers bend on Red Creek. Private Beach access very secluded. Enjoy your drinks on the deck overlooking the water or just jump in go tubing. House towels only please bring your own for the creek. The kitchen is set up with new appliances as well as microwave, coffee Maker, toaster and pots and pans. Huge yard for privacy y Kids can play safely as this house is at the dead end of the property. Balcony overlooks beautiful Red Creek with access next to you for your canoes or kayaks. Bring your own and enjoy the sites. This house sits on stilts so there are stairs to get to the living space approx 16ft. IF you are looking for accommodations for multiple families on the same property but with your own spaces and privacy please call we will have just what you are looking for. It was beautiful, the whole family really loved it! Definitely will go back! Thank you for the nice review and your stay! Glad you enjoyed our little piece of God's country! Hope to see you soon. We had a wonderful time. It was somewhat ruffing it but that is what we expected. I agree with one guest that the cabin could use some refurbishing but it was clean, the beds were comfortable and the appliances are new. The outside area was beautiful and so peaceful. We sat around the campfire every night enjoying family time and for once the children were not on their electronics. The creek was very close and the dogs swam everyday. The cabins are spaced so far apart that you can’t see your neighbors so we didn’t worry about the kids and dogs bothering anyone. All in all a wonderful place to go to get back in touch with nature and your family. Our family highly recommends this cabin! I have only a few suggestion for the owners. The kitchen needs a new can opener and a baking sheet. The chair in the living room is broken and needs to be fixed before someone takes a tumble. We had a wonderful stay! The creek is phenomenal and the cabin is very private. We took a canoe with us and paddled up river for a bit and then let the creek take us back. At one point we wound up speaking to each other in a whisper, as to not break the quiet peacefulness of the creek. We have now rented Uncle Ralph's cabin and Wendel's Place. There is one other cabin here that we'll have to check out too. I plan on coming back here often and highly recommend these properties for anyone looking to get away from it all! Thank you very much for the nice review. Please come again soon. Glad you had a great time and enjoyed our little piece of God's country. I have thought long and hard about whether to let you know or not, but I decided you need to know for future customers. When we arrived on Thursday, the bathroom was in dire need of cleaning. If we had not driven so far - especially with our lab, we would have turned around and gone home. Instead, we went to dollar store and purchased cleaning supplies. The toilet had ‘stuff’ on the seat, on the lid, behind lid and outside of the bowl. Also, I cleaned urine to the best of my ability on the side of water heater. Also, I scrubbed the tub and its walls. I hand mopped the bathroom floor. The faucet had some minor filth behind the faucet but we could have lived with that. After cleaning and sanitizing the entire bathroom, I swept a large amount of yellow animal hair in the living area next to curtains. We understand that others have used this house, but we expected it to be cleaned prior to our renting it. If the bathroom would have been cleaned, the floor is something we could have lived with. The bbq grill had hole in bottom so could not be used. We had brought our supplies to enjoy peace and quiet while grilling, but instead ate sandwiches that night. Friday morning, our lab enjoyed playing on the sand bar, so that was the only enjoyment we were afforded. After that, we packed and left yesterday (9/28) around noon. Hi Myra, I'm sorry to hear that you had an issue with the cleanliness of your rental. I can assure you that my cleaning lady does exceptional work. You can go back and look at reviews to confirm that. I spoke with her after your email and she stated that she would make sure to go in and triple check in reference to the issues you stated. Of coarse, with you doing the work yourself, instead of leaving there was not much she found undone? All I can think happen is that someone went in and squatted during the week after she cleaned and she was not aware. I'm very sorry for your findings and I am more than happy to credit you back some of your rent for the inconvenience if need be? Please let me know your thoughts? Thank you for your patience and for your stay. Back in June I went with my brother and his family to this same property (they stayed in Uncle Ralph's cabin). My dad cancelled at the last minute, so I invited my friend Tammy to go so I didn't have to stay in a cabin alone (same one - Wendel's Place). We both loved the tubing/floating to City Bridge so much that we had to schedule another vacation. This time I went with her family and they loved it too! Next year her husband wants to try kayaking from 49 down to the cabin, so we will probably all be back. The only thing I was concerned with was the upstairs commode. I worried about it stopping up both times. But everything else was great! The river was beautiful! The house could use some TLC though. The bathroom shower head sprayed the wall as much as it sprays you and the hot water knob is broken making it very hard to turn on and off. The outside bathroom was really convenient to wash off after being in the river except the drain in the floor was clogged so there was a big dirty puddle of water where the shower is. Otherwise the house was pretty comfortable. Enjoy rustic deep woods camping in this newly renovated beautiful 900 square foot cabin. The camp has everything you need to make your vacation a memorable one. The cabin has satellite TV, it's own beach, a view of beautiful Red Creek right from the front porch and all the privacy anyone could be looking for. You can enjoy swimming, cooking out, fishing, rafting and many other fun family activities or just relaxing under the many old oak trees that surround you. If getting away from the hustle bustle and relaxing with the family is what you are looking for, this is the vacation rental made for you.